Florence is home to many historic buildings. This Palazzo is just one, its rich history is what makes it unique to Florence. From the center of government to newly renovated shops it has seen it all. 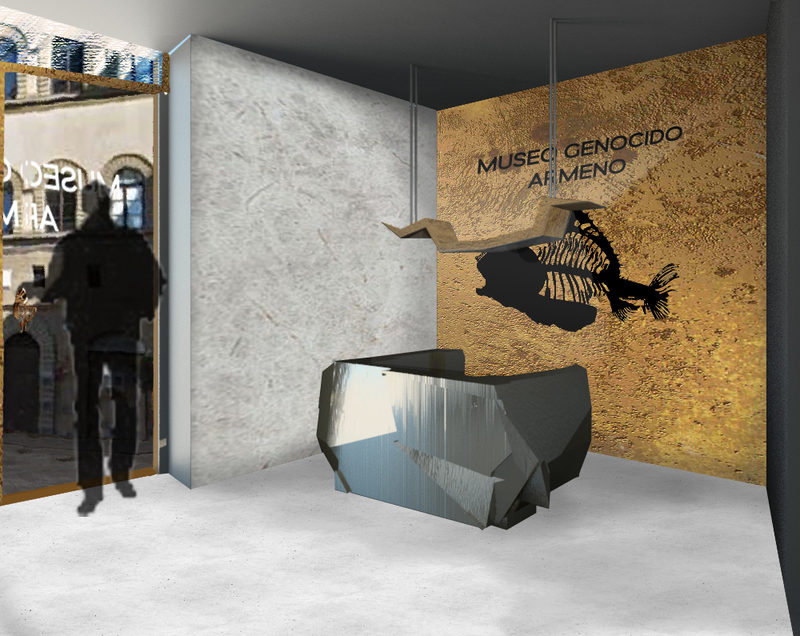 Housing a Museum for the Armenian Genocide captures part of Europe and the worlds hurt to inspire a new generation to learn from the past and make a brighter future. Logo based off the art work "Voiceless" In Memory Of Armenian Genocide 1915 by Aram Vardazaryan. Showing the bodies of the lost inside the fishes bones. Entrance and courtyard renderings. Atomospjere of reflecting on our most hidden parts. Close-up shot of existing bronze statue proposed for the entrance and courtyard. Even with news articles coming out at the time, this tragedy was not spoken of for decades. The Turkish Government silencing those who tried bringing light to the event. Rendering of the 3-D video room. Towards the end of the trip through the museum lies a 3D video experience of the Armenian Genocide. This 5 minute video puts visitors in the burning cities and among the survivors, and the lost. With survivor accounts overlaying the video and a cramp space, visitors can feel the genocide. Materials pallet grows darker and less reflective, in coordination with the path through the museum. Beginning sketch idea to final rendering of the burial room. Being smaller with existing exposed brick allowed for the space to truly feel enclosed. With the use of real dirt and stone and a sculpture of the victims is this final room leave the feeling of being buried alive with the bodies on the ground. Burning cities was a popular way to wipe out the Armenians from Turkey. In this room ash surrounds visitors, the charred rubble still glows form the embers and the smell of burning hangs in the air. The light at the end of this room, just like those in the genocide looks better, looks like hope. but leads to more heartache as you enter a desert, used to starve and exist victims. Section rendering of courtyard stairwell.